Having served as special assistant to a United States President, deputy director of the White House Office of Public Liaison, communications director for a U.S. senator, and an author of a political memoir, Timothy Goeglein is a recognized name in American politics. At Concordia University Wisconsin, Goeglein holds another distinction as the man who planted the seed directly to former U.S. President George W. Bush, to speak at CUW’s 2004 commencement ceremonies. Goeglein himself was a commencement speaker at Concordia University in 2002. At the time, he was impressed with the people he met, particularly the president of the university, the Rev. Patrick T. Ferry, Ph.D., and noted that the university community embodied the same virtues that the Bush administration shared. A couple years later, Goeglein had the opportunity to share that Concordia aroma in the most powerful of ways. While in a meeting at the White House, a team was exploring opportunities for President Bush to speak in a higher education environment. Without hesitation, Goeglein suggested Concordia University Wisconsin. While no one in that room had heard of CUW, Goeglein’s good word was enough for the President. 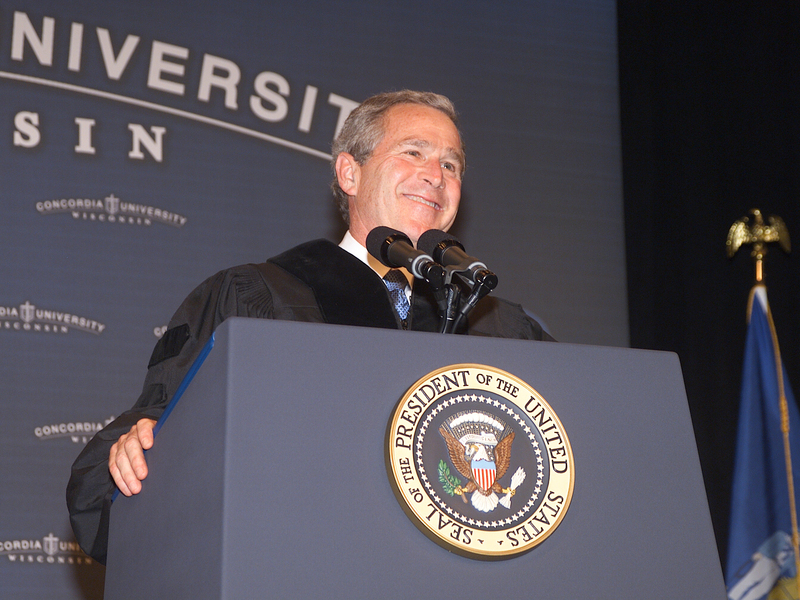 Within a few weeks President Bush brought a message of Christian faith in politics to the graduating class of 2004. Even Goeglein admits he was stunned by the rapid response and describes the sequence of events as providential. 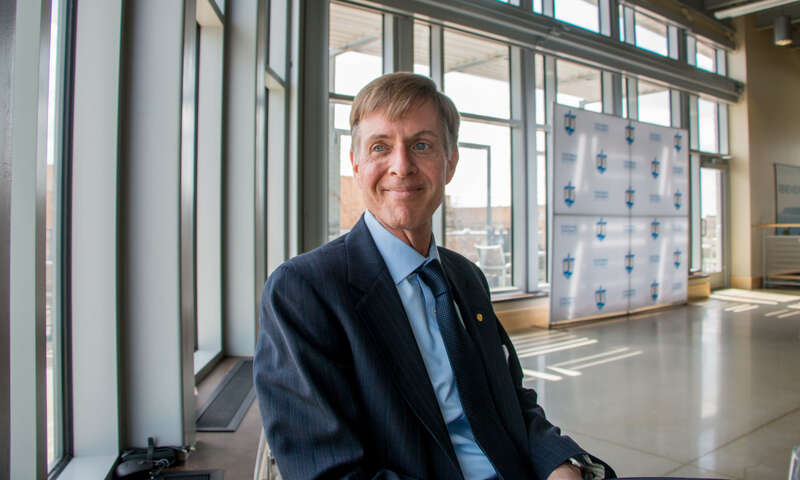 Goeglein recently returned to campus to keynote CUW’s 2018 President’s Roundtable. He spoke to invited guests about being Christian in the public square and shared his message of hope and optimism in the next generation. President George W. Bush speaks at Concordia's 2004 commencement ceremony. In his current role as vice president of external relations for Focus on the Family, Goeglein spends much of his time advocating for Christian families amongst policy makers, legislatures, and politicians in Washington, D.C., where he has lived with his wife, Jennifer, and their two sons, Tim and Paul, for 27 years. When he isn’t dealing in policy in the nation’s capital, Goeglein visits college campuses to talk with students about their role as Christians in the public square. He thinks that Millennials are getting a bad reputation, particularly by those who don’t spend any time with young adults. Even during challenging times like these Goeglein describes himself as a “hopefulist” and confidently predicts that the best days of our country, culture, and civilization are ahead of us. He reminds Christians that our faith teaches us about regeneration, and that beauty and revival always follow the darkness. Goeglein has learned first-hand about the power of regeneration and the absolution of a Christian leader. As the longest serving member in the Bush White House, he was the eyes and ears of the President, particularly in matters of religion and faith, and enjoyed a certain status that came with that position. Goeglein, a prolific writer, admitted to letting pride cloud his judgement when he was caught plagiarizing someone else’s words in multiple articles at the height of his political career during President Bush’s second term in office. While his error in judgement cost him his job (he resigned immediately), President Bush famously offered him total and complete forgiveness and mercy. The two even prayed together to solidify the experience. President Bush’s example of Christian leadership is a story Goeglein never tires of telling. As he explains, “I embarrassed and offended the leader of the free world, a man whom I admired and considered a friend, and he extended the freeing and wonderful grace that is at the very heart of confession and absolution – categorically, with no exceptions.” The two men remain friends to this day. During his visits to college campuses Goeglein shares the story with students to remind them that God never tires of offering us His forgiveness and grace. He challenges Christian students to become Christian leaders who openly confess their faith and extend mercy and grace to all the people in their lives; without exception. Goeglein often concludes his remarks by referencing his friend David Brooks’ distinction between the “eulogy virtues” like character, humility, and grace, and “resume virtues.” With a final reminder that professional benchmarks are important, but character and integrity are eternal.